What is Thinking Into Results? Thinking Into Results is a 24-week process for radical personal transformation. 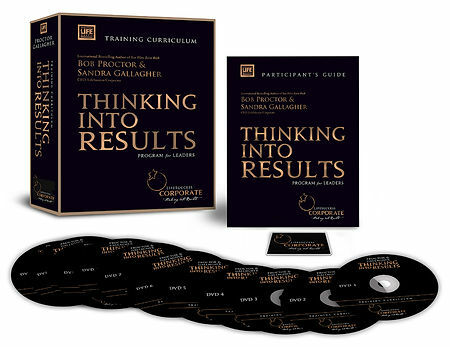 Developed by world-renowned success expert Bob Proctor and corporate attorney Sandy Gallagher. The program is a comprehensive consultant-guided program designed to facilitate positive, profound, permanent change in any area of your life. What Comes With The Thinking Into Results Coaching Program? This in-depth program comes with 12 in-depth individual lessons that focus intensively on a single essential element of the achievement process, with each lesson building upon the insights of the last. 12 dynamic digital videos and mp3 videos [optional DVD set available] featuring world-renowned success expert Bob Proctor, viewed twice a day, morning and evening, that will motivate you and reinforce the lesson content at multiple levels of consciousness — a critical key to achieving change quickly and making it permanent. A 200 page workbook that contains activities that you can learn and apply immediately, so you see and feel yourself changing, progressing, and moving closer to your goal in real time. 24 weekly LIVE 60-minute coaching/consulting sessions with PGI Certified Consultant Patty Wilson that will give you the support, encouragement, answers, and expert guidance you need to keep moving forward on your journey to achievements.